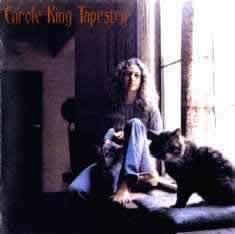 Originally released in May of 1971, Carole King's "Tapestry" soon become a smash hit. By the following month, it had reached the top position on the album charts in the U.S., where it remained for 15 weeks. It really shows its popularity not by the length of time it remained on top, but by the amazing 302 weeks that it remained on the charts, a record for a female artist that still stands today. To date, 20 million copies of "Tapestry" have been sold, 10 million here in the U.S., and another 10 million abroad. It produced for top ten singles, and one, "It's Too Late/ I Feel the Earth Move", reached the top position on the singles charts. The album also received four Grammy Awards: Album of the Year, Song of the Year ("You've Got A Friend"), Records of the Year ("It's Too Late"), and Best Pop Vocal Performance- Female. This was a major accomplishment, never before achieved by a female artist. If that wasn't enough, other artists had hits with cover versions of songs from the album. James Taylor had a number 1 single with his Grammy winning version of "You've Got a Friend". Quincy Jones received a Grammy for his instrumental rendering of "Smackwater Jack." With the rich history that "Tapestry" has earned, in both popular and critical acclaim, it should come as no surprise that Classic Records released this album recently, on a beautiful slab of 180 gram vinyl, encased in a gorgeous gatefold jacket. Interestingly, the Classic release is the only version to be released that is not from a re-EQ'd production master: this is the only version available that remains true to the original master tape. I own quite a few Classic reissues, and I had expected a lot from this album in terms of sound quality, unfortunately, it didn't deliver. Sure, it has a wee bit more definition and clarity, but with Classic, I had come to expect great strides in fidelity over a standard issue release, whether vinyl or CD. I compared the Classic version to an original vinyl pressing, as well as a CD, and I was left with a feeling of "...and the big deal is exactly....what???" Unless you have to have this version, I would recommend buying the standard CD, and spending the savings elsewhere. Classic Records has too many wonderful offerings to justify the purchase of this one.